Ram Gurung ("Babu") planned and guided our group of 8 friends on an amazing trek through the south western corner of the Annapurna Circuit. He reserved wonderful hotels in Kathmandu and Pokara, took us to the best restaurant in Pokara [the Black and White], and led us to various sites we expressed interest in. When the route would be a difficult walk through the city, van or taxi were arranged for us, with Advent Himalaya guide. Babu, assistant guide Megha, porters, and cooks trekked us through the foothills of the Himalaya Annapurna region. They selected the best tea houses for our night's stay, ensured sanitation practices in the kitchens, and found reliable lunch and snack stops for us on trek and road trip. 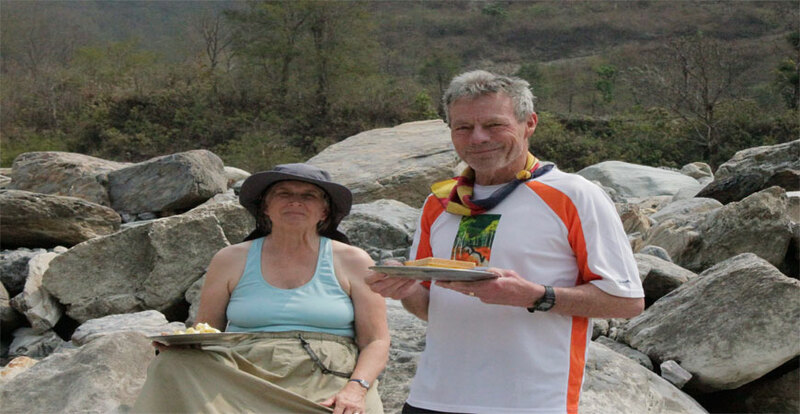 Adding to our trekking experience, Babu scheduled a 2 day raft trip, and 4 days viewing wildlife at Chitwan National Park. One of our group members did become very ill at the very end of trek, as we over-nighted in Pokara. His illness resulted from days of insufficient water and fiber [vegetable] consumption, complicated by a previous condition. When Babu heard of the illness he sent our trekker to the private tourist hospital which provided very competent care. Babu continued to visit our ailing trekker each day, through surgery and recovery, updating his status for our touring group of 7.